Brown the ground beef in a large skillet or sauté pan; pour off excess fat. Add the onion and garlic and cook over medium-low heat until onion is tender. Stir in tomato paste, water, sugar, and seasonings; blend well. Simmer, uncovered, over very low heat for 1 hour. 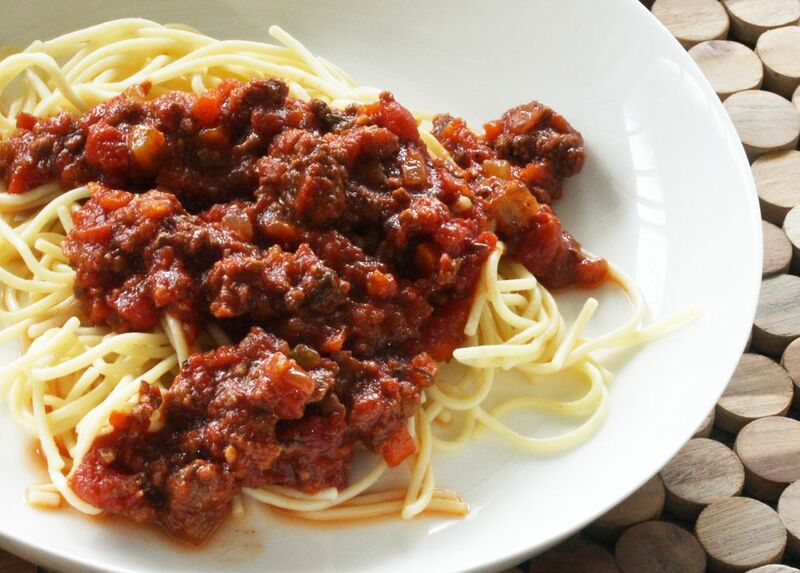 Serve over hot spaghetti or linguini and serve grated Parmesan cheese on the side. The sauce may be frozen in freezer containers for 3 to 4 months. Thaw the sauce overnight in the refrigerator or cook in a covered saucepan over low heat until it is hot and bubbling. For a low carb diet, serve the sauce over spaghetti squash strands or summer squash or zucchini noodles. For a vegetarian sauce, replace the ground beef with 2 cups of sliced zucchini, 1 thinly sliced or julienne-sliced carrot, and 1 cup of sliced fresh mushrooms. Simmer until the vegetables are tender. Add about 1/2 cup of sliced mushrooms to the skillet along with the onions, or add 1 small jar or can of drained sliced mushrooms along with the tomato paste. Sauté 1/2 pound of Italian sausage with the ground beef. Sauté 2 to 4 strips of bacon, diced, with the ground beef, or a few tablespoons of pancetta. Add 1/2 cup of diced green bell pepper along with the onions. Replace the dried basil with about 2 tablespoons of fresh thinly sliced basil leaves (chiffonade). Replace 1/4 cup of the water with dry red wine. Add one 14 1/2-ounce can of diced tomatoes to the sauce along with the water. Add about 1/2 teaspoon of crushed red pepper flakes along with the tomato paste. Add about 1/2 cup of fresh grated Parmesan cheese to the sauce about 10 minutes before it's done.